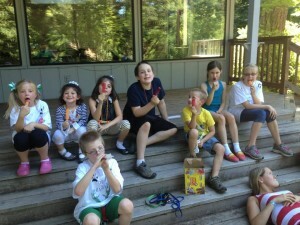 The main reason why our family vacation took us to the Pacific Northwest this year was to attend camp with ASDA. Every year, the organization puts on a camp for kids who have an interest in animal training. This year, the organization decided to do a separate one-week camp for the kids who have received autism service dogs and their siblings. When I heard about this, I knew it would be a perfect way to spend our vacation this year. The camp is structured so that everyone gets what they need: The service dogs get some time with trainers to brush up on any skills that have gotten rusty. 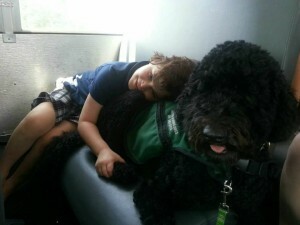 The whole camp goes on a field trip each day, so the kids with autism get to practice community outings with their dogs. 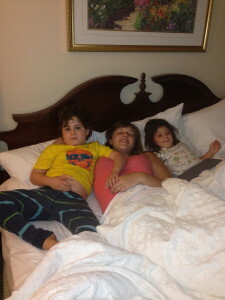 The siblings get to spend time with other siblings who are in a similar situation with the unique family dynamic that having a brother with autism creates. All the kids (with autism and without) get to be in the same camp together – a situation that would be virtually impossible anywhere else and felt special to my girls who often want to do things with their brother but can’t. And, most importantly for vacation purposes, Barry and I got about 5 hours each day of grown up time to explore Portland. For the girls, it was exciting to see the place where I spent my week of training with Hope. For me, I felt so happy to return to the city where I had my most life-changing experience to date. Portland felt like a second home. The girls from ASDA felt like family and friends. I was so happy to come back and reconnect with them. Because I wanted to maximize my ability to be social with the ASDA crew, I made a last-minute decision to invite one of our babysitters to come along with us for the Portland portion of our trip. It felt like an insanely indulgent thing to do, but I rationalized that this would be our first family vacation where there wasn’t a kids’ club that would care for Gray or the other kids. I didn’t know how easy or exhausting Gray might be on this trip and I didn’t want to take a chance on Barry and me taking turns caring for Gray while the other got to go out and do fun things with Zoe and Lena. I also really wanted to have the opportunity to enjoy these people beyond camp drop-off and pick-up and I wanted Barry to come along. We have never traveled with a “nanny” before, so I wasn’t sure what to expect. Fortunately, we were traveling with Haley, our college-aged babysitter who has been with my kids for almost 4 years. I often say that an autism mom’s best friend is a great babysitter. Haley definitely proved that point. Haley became part of our lives through her older sister, Lauren. Lauren was in school to become a speech therapist when Gray was in preschool at Callier. She answered an ad I had posted looking for someone to do some extra work with Gray in the afternoons. Her response email was so warm and sincere that I knew she would mesh well with our family. That was 6 years ago. What followed was 2 years of devoted care from Lauren and, when she graduated and became a licensed Speech Therapist, Haley (then a high school student) stepped in to seamlessly fill her spot. Over the years, Haley and Lauren have become a big part of our family. When I told the girls that Haley would be joining us in Portland, they cheered and, when Gray saw Haley in this strange setting, his face lit up with glee. Our first morning of camp proved to be a bit hectic and we were very grateful for the extra set of hands. Getting 3 kids and a dog down to breakfast and off to camp took a lot of effort, but everyone was excited to see Kati and the other people who have worked so hard to get these dogs ready for their big jobs. The girls were eager to spend a week at camp with their brother and they were even more thrilled at the idea that they would help with training the puppies who had not yet graduated. Gray was happily rolling along with us. He loved the new setting, sleeping in the same room with Barry and me, eating unlimited Froot Loops at the hotel breakfast, and he quietly gazed out the window as we drove off to camp. I immediately relaxed when I saw the set up that ASDA had put together. Anticipating that Gray would be a handful, Kati had assigned one of the puppy raisers (who is also an autism specialist) to be Gray’s shadow for the week. She told me that she had lots of experience with Proloquo on the iPad and I knew within minutes of meeting her that she and Gray would do just fine together. In addition to Gray’s shadow, Laurel – ASDA’s program administrator, is also an autism specialist in the school district. 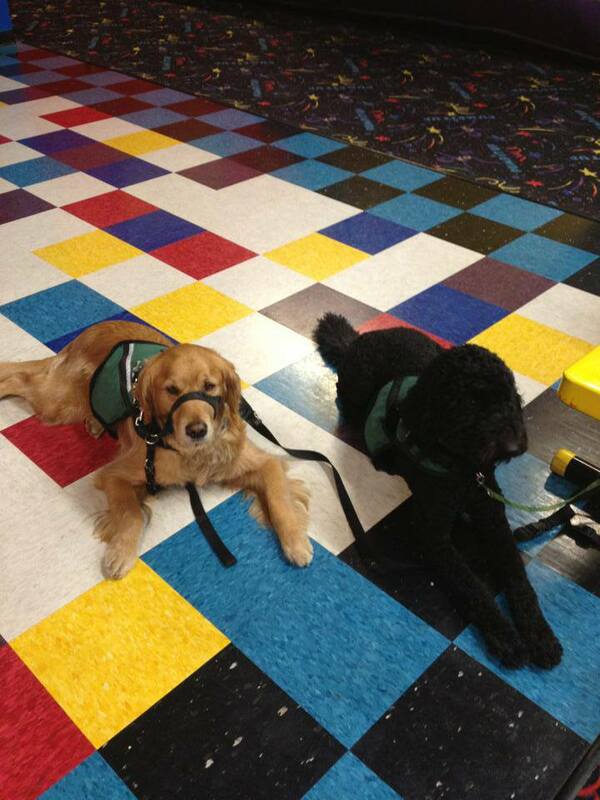 The program was set up so that the kids with autism would get some therapy work in the morning while the trainers took their service dogs for some “tune-up” training. Meanwhile, the siblings got to work on an art project and socialized. Every afternoon, the whole group went on a field trip to different kid-friendly places (Pump It Up, the Portland Children’s Museum, a movie theater, a mini-amusement park and an arcade/jungle gym fun center). When I picked the kids up each afternoon, they were brimming with stories about how great the day had gone. Zoe was proud to report Gray’s good behavior and accomplishments. Lena was exuberant over her assignment to share puppy training duties with Zoe in working with a dog that was set to graduate in the next class. At the end of the week, Kati met with each family to give a report of what their service dog had worked on and gave us exercises to continue at home to keep the skills sharp. When I look back on my selection process for finding the right organization to provide Gray’s service dog, I’m not sure I fully realized how lucky I was in picking the right one. Most of the other service dog organizations that I looked at provided animals for a variety of disabilities including autism. I chose ASDA because they were the only organization who focused solely on autism. Looking back, that appealed to me because I knew that the needs of a child with autism are very different than other disabilities. For example, I’m pretty sure that this is the only disability where the person being served is likely to run away. I was thinking about the service animal and her training. It never occurred to me that I also needed to consider the relationship that the organization would have with my son and our entire family and our training. After spending a week back in Portland at camp, I am convinced that ASDA is uniquely qualified and committed to serving families like mine. The level of care and expertise that they bring to their clients is unparalleled. I guess we have a new annual summer plan…Portland, we will see you next year! Glad to see that you and your family had a great trip to Portland! My boy will receive his dog sometime next year and was able to attend camp the week before your family. You are right, the ASDA is a wonderful organization run by some amazing people. I’m fortunate to already live in Portland and am grateful that I found them as well. Thanks again for sharing your story.